Too Faced Throwback Lipstick ($22) in Too Too Hot is one of ten limited edition lipsticks that launched to celebrate the 20th Anniversary of the brand. Each of the ten shades is inspired by the original eight shades that Too Faced first started the brand with but with a re-imagined take on the color and formula. Each shade contains avocado oil to give it a creamy, hydrating feel as well as multi-reflective glitter for a super sparkly look which of course is what attracted me to the collection to begin with. Because of course, who doesn’t love a good sparkle shade? I picked up Too Too Hot because I’m thinking far into the future to Christmas and this was a stunning red that seems like it would look great for the Holidays! Too Faced Throwback Lipstick arrives in a gorgeous glittery red barrel that holds 0.10 oz of lipstick. Each of the ten shades has their own unique color barrel that reflects the shade inside. Too Too Hot is a cool ruby red with multi-colored shimmer (looks like silver, blue, and pink shimmer in there). It’s a gorgeous shade that doesn’t look glittery or sparkle but comes across as a more smooth, metallic finish without the frostiness I commonly associate with metallic lipstick. It’s really gorgeous and looks amazing with a little clear gloss on top but all its own it does have a slight sheen giving it a shiny look. The texture is very creamy and it glides onto lips smoothly with a lightweight feel that has a certain slickness that gives it a nice smooth application across my drier lips. It felt very lightly moisturizer and the color wore for a good solid five hours but once it wore away it did leave a stain and some bits of shimmer behind on my lips. 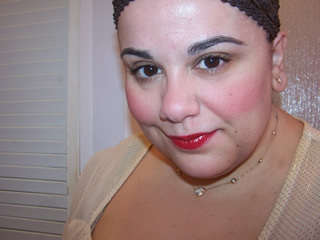 During the wear, my lips felt very comfortable and the color didn’t fall into my natural lip line. The pigment was fantastic with beautiful opaque color on a single application and only intensifying with each layer applied. I was disappointed in the Then & Now Eyeshadow Palette but I will be Muse Approving and purchasing more of these gorgeous Too Faced Throwback Lipsticks! Too Faced Throwback Lipstick is a new, limited edition collection featuring 10 sparkly glitter lipsticks inspired by the original eight that Too Faced started their brand with. Each lipstick is 0.10 oz in size and $22 each. I had a great experience with the shade I purchased which was Too Too Hot. This formula was easy to apply with a smooth glide across my drier lips that had a slightly slick feel and a lightly moisturizing feel that wore for five hours with full opaque coverage on a single application. Colorful selection of shades with some great alternative colors such as purple and blue. Beautiful formula with great pigment, long wear, and a hydrating feel. Wore strongly for five hours without migrating or feather. Pretty sparkly finish that had a metallic look without appearing frosty. I wish the shade extension was larger as I can see myself indulging in several more of these. Anyone who enjoys a sparkly lip look should get on well with this formula or anyone who has fondly remembers the start of Too Faced and wants to re-live some of their makeup years gone by. It is super pretty on you! aw thanks Paige you’re too kind! That’s really pretty! Red is a great color on you. I was thinking I would pass on these but now that I see they aren’t glittery, etc when applied I may take another look. Perfect for fall! Perfect! I always love you in reds. aw thanks Blee you’re way too kind! This whole look is soooo pretty on you and makes me less sad that summer is nearing its end. What eye products are you wearing in this look? Love the shadows and how it all goes together. Whoa! ” Red Hot”! These reds are magnificent on you!